Description of decorations: Natural rocks, stream sand. 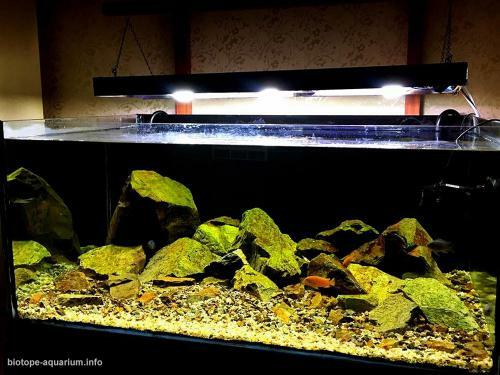 Description of equipment: Quick Expro 1500L Filter, 300w Smart ProTemp Heater, 2x39w Sylvania Aquastar 10000K T5, 3x39w Philips 865 6500K T5, Sobo wp200 Wave Maker. Water parameters: 25-28C, pH: 7,5 – 8,5. Description of the area surrounding the biotope: Lake Malawi; Malawi is the third largest lake in Africa, located between Mozambique and Tanzania. Its length is about 600 km and its width is 80 km in some places and its area is 31.000 km2. The depth of some places reaches up to 700 meters and is the seventh largest and fourth deep lake in the world. It is also considered to be one of the oldest lakes on the planet. Although the experts cannot give a full date, the age of the lake is estimated to be between 3-20 million years. Since the lake has existed, its waters have continually increased and declined in different periods. There is evidence that the lake is more shallow than 25,000 years ago. Since then there has been a sedimentation of 40 meters. The sedimentation at the bottom of Lake Malawi is believed to be about four kilometers deep. Because of this sedimentation thickness, the researchers think that the lake is old. The lake reached its highest level in 1980, and since then has visibly improved, but is currently on the rise. The reason for the increase in biological diversity, the most interesting feature of the lake, is this constant change. The waters of the Lake Malawi have caused the greatest diversity in a single body of water. Lake Malawi has about 1000 kinds of fish, more than the number in Europe and North America. Some of these are catfish, minnows, killifish, a real marine eel, vertebrate eels, and the most exciting cichlids. Description of the underwater landscape of the biotope: It is the most common Mbuna group in Malawi Lake. The cichlid species within the Mbuna group is very large. 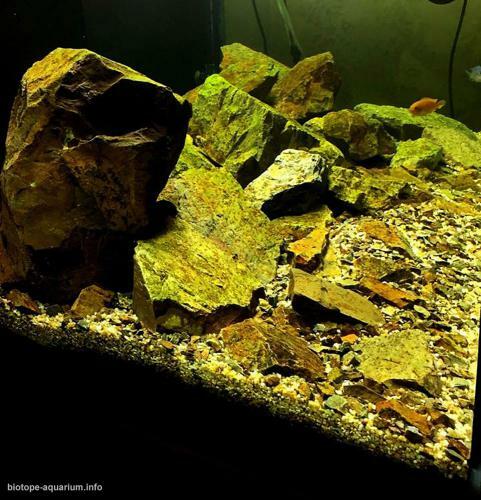 The cichlid species of the Mbuna group inhabit the underwater rock cliffs in the Malawi lake, because they are hidden in caverns, crevices and caves formed in defensive rocks due to attack by both their species and other species. Since this behavior lasted for thousands of years, it has been this way of life and lifestyle in the cichlids of the Mbuna group. In the Mbuna group, it is up to the male fish to protect their nests, and to prevent stress on the female nest in the nest, men defend the defense. Because the Mbuna group of cichlids are quite numerous in Malawi Lake, nest and nutrient sources (rock algae and micro organisms) are very important and exhibit a vigorous behavior against both their own and other Mbuna species in protecting their own nutrition areas. Description of the parameters of the habitat: In the south-east, mwera wind comes in. 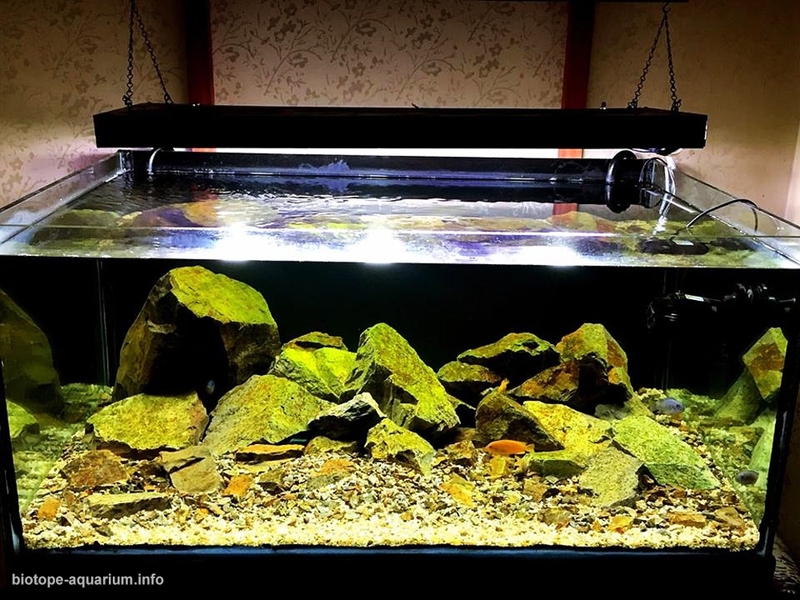 During this time the temperature outside the water drops to 15 degrees, and the water temperature rarely drops to 23 degrees. List of fishes and invertebrates occurring in the nature biotope: 1 Male 2 Female Metriaclima sp. ”Zebra Chilumba” Maison Reef, 1 Male 2 Female Metriaclima sp. “Msobo” Magunga.